Animal breeders work with two tools: selection and pairing. When animals are selected for breeding, the frequencies of alleles in that population always change. Some alleles may even be lost, or become fixed, when the allele is the only one in that population. Both of these chances lead to losing genetic material. This loss of material may go unnoticed for a long time, because following alleles in practical breeding is not feasible. To start with, there must be enough genetic variation in the population to allow for any genetic progress. Selection intensity affects strongly to the progress of breeding. Selection intensity means the percentage of animals chosen for breeding from a particular population. The formula is i = SP/σP, where Sp is the selection difference. i expresses the selection difference measured in units of standard deviation from the population fenotypical mean. Let's say we select sheep based on their weight at 1 year of age. The population mean is 55 kg, and the mean of the chosen animals is 67 kg. Standard deviation is 10 kg. Then i = (67-55)/10 = 1.2. From a selection intensity table (such as this), we see that i of 1.2 means we'll select a bit less than 30 % of the animals in the population. Usually i < 1 is weak selection, and i > 2 is strong selection.The less animals we choose, the more genetic progress we get. However, the amount of offspring per animal and inbreeding may limit our choices. To keep the population size stable, there are minimum amounts of animals which should be chosen. For cattle, the limits are 50-65 % of females and 0,5-1 % of males. For poultry, 1-2 % of females and 0,5-2 % of males is enough. The values in The Formula (seen on the left) have connections to one another and to animal properties. Females have less offspring than males, some properties can be measured only from females, and they are sexually mature in different age (difference in L). The differences can be counted for by calculating the progression as the sum of the genetic value of females and males, divided by the sum of time between generations. Since different information sources have different weighting factors for females and males, the genetic values are calculated differently. For cattle, cows are evaluated based on their own results. Bulls are evaluated based on the results of their offspring. So, to optimize ΔG, every factor must be optimized at the same time! Pairing comes always after careful selection. Three pairing strategies exist: random pairing, assertative pairing and pairing based on kinship. Random pairing means simply pairing the selected animals randomly. In this strategy, alleles inherit randomly, and the population follow H-W equilibrium (if also random selection is used). 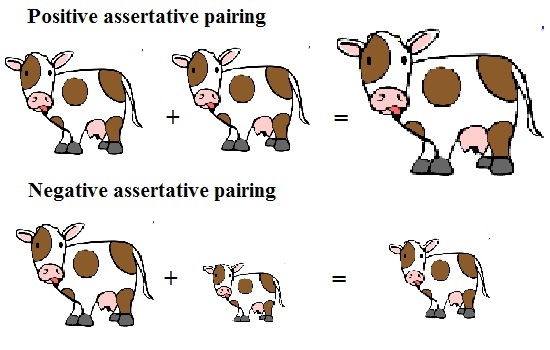 Assertative pairing means that fenotypes of the animals are considered when pairing them. It may be positive or negative. In positive assertative pairing, the animals with the most extreme results in a trait are paired, creating offsprings with extreme results. For example, pairing large bulls with large cows or small bulls with small cows creates either very large or very small calves. Positive pairing temporarily increases genetic variation. Negative assertative pairing, or pairing different animals, is about compensating or fixing trait results. When large bulls are paired with small cows, medium-sized calves are born. However, the calvings will be extremely difficult, so it is important to choose the pairings correctly (small bulls+big cows works much better). Pairing based on kinship is either avoiding or using inbreeding. Inbreeding means pairing animals which are closer relatives than "cousins". Inbreeding increases the amount of homozygotes, which leads to inbreeding depression. First production traits are affected: milk yield starts to decrease, amount of meat produces decreases and so on. If the inbreeding continues, resessive traits (usually illnesses) became more common, and fertility and survival traits start to decrease as well. The opposite of inbreeding depression is heterosis, which happens when two completely different lines are mated. Heterosis is strongest in the F1 generation, and it increases the amount of heterozygotes. Heterosis may lead to offspring which are better than the average of their parents, thus exceeding breeding expectations. Note that some level of inbreeding cannot be avoided. Look far enough in any pedigree (even your own), and at some time there will be same names. This is especially true in small or new animal breeds, but works on humans as well. The blog of Discovery magazine states that 1 out of 200 men are direct descendants of the furious fighter (and lover) Genghis Khan! Some of the basic questions of animal breeding is "how far can we go?". Have the cattle populations today reached their production maximum? Is there anything left to improve, and do we have enough genetic variation left? Ethically, one can ask are we doing the right thing? Are we really improving the animals, or just improving their productivity at the expense of their health? very small, and have delicate health with extra risk of bone fractures. Genes and traits have correlations. Improving one trait may improve or worsen another trait. 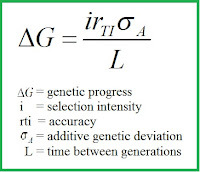 While we can estimate ΔG, genetic frequencies change, and mutations happen. Additive genetic variance decreases due to selection (Bulmer-effect). And, we still have only a basic understanding of geneology, with much to learn about interactions between genes and genetic regulation. Estimating the long-term effects on animal breeding is thus just guesswork. breeds. And again, developing traits has its price. Increasing animal's production increases it's need for feed and susceptibility to problems in metabolism. Reducing extreme traits reduces health risks, and pairing across breeds increases variation but decreases the level of racial purity. This was really informative to read upon dear, so thank you so much for this post. And honestly im a big fan of cross species breeding may you can do a post about that in the future.